If you like your Christmas markets sandwiched between mighty imperial buildings, then Maria-Theresien-Platz is another must on your list. The square has the Art History Museum on one side and the Natural History Museum on the other. So you can feast on sausages and strudel, view the “Feast of Venus” by Rubens, then discover how our ancestors coped when the giant animals of prehistory objected to being turned into sausages. After all that culture you might need a bracing drink (also available from the Christmas market). The setting is, of course, fantastic. 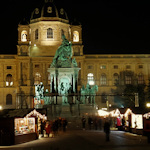 As well as the two museums, the square borders the Ring, beyond which are the Heldentor gates and the Hofburg palace. The other side borders the main entrance to the Museumsquartier. The market huts curl their way around the square’s fountains and the centrepiece monument to Empress Maria Theresa, unveiled in 1888. So you eat your hot dog below the alert gaze of the lady who famously said, “While other nations do battle, you lucky Austria, you wed.” She had 16 children to exploit for her peace-through-marriage policies. The quality of the stands is, as usual for Vienna, high. In fact, the only stand I ever saw that looked vaguely like it was selling plastic toys turned out to be from the Natural History Museum. So we can forgive them, given the location. You’ll find all the usual goodies, of course, plus a few extras as the market is one of the largest. For example, on my last visit, there was a stand selling incense and myrrh from the Far East, and another selling absolutely exquisite wooden models that looked as intricate as the insides of a watch. A chocolate stand offered a host of special varieties, including organic selections from Zotter (my favourite chocolate supplier). There was also a stand selling traditional snow globes, notable because the first patent issued for a snow globe was to a Viennese surgical instrument manufacturer. The family-run business still makes the globes today. Make sure you have a 50 cent coin with you. There’s a toilet facility, but it costs 50 cents to get into it. This is definitely one to do after dusk, with the closed-off fountains on the square decked out in Christmas lights, both museums lit up, and a ghostly Empress watching over it all. Despite its wide layout, the central location means the market gets busy when the crowds gather for an evening mug of punch. So try and get there for late afternoon, when the sun disappears but the locals are still at work. The market usually converts to a New Year’s market (the Silvesterdorf) after the 26th until the end of the year.